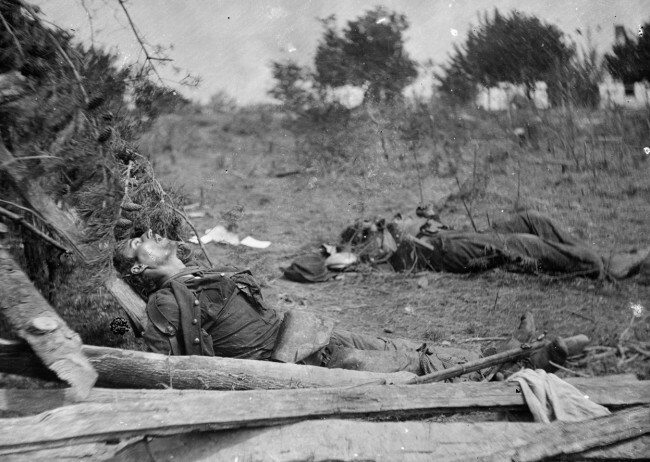 Grant’s army lost almost 18,000 killed, wounded, and missing in the battle of the Wilderness. That was about 15 percent of his army. Any other Union commander would have retreated across the Rapidan, as several had. But Grant lunged instead for Spotsylvania Court House to the east. Spotsylvania lay at a crossroads. Whoever controlled Spotsylvania controlled the road to Richmond. The Union army, beaten at the Wilderness, cheered when Grant marched them south. There was a foot race – literally – to Spotsylvania. The First Corps of the Army of Northern Virginia, commanded by General Richard Anderson after General Longstreet had sustained a severe wound in the neck, won the race. When the Union arrived, Confederates faced them. offers the attackers sides to attack as well as a front. 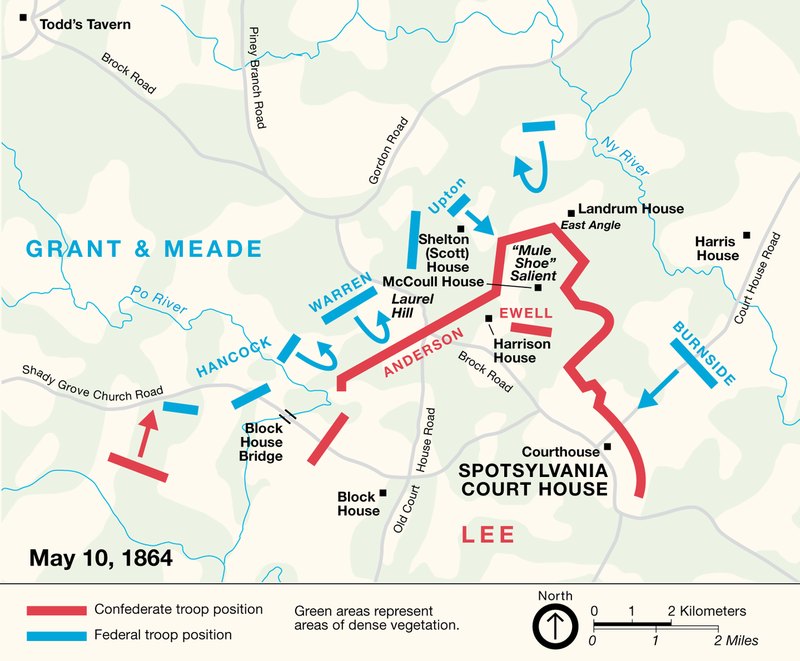 The Union army probed Lee’s flanks on May 9 and 10 without success. Late in the afternoon of May 10, however, a 24-year-old Yankee colonel named Emory Upton tried a new tactic. He picked 12 regiments, a total of 5,000 men, to move silently through the woods on the Confederate left and attack in a rush. Upton’s force struck the portion of the Confederate line that Doles’s Brigade held. 12, In a matter of minutes,the Yankeesn overran Doles’s entrenchments. They captured a thousand men. Gen’l Grant got repulsed in every attempt to break our lines there [at the Wilderness] and began to try to flank us on our right. On the 8th of May, we found ourselves 20 miles east, just opposite his troops, and I commanded a reserve brigade picket line. I was on duty all night on the 7th, in easy talking distance of them. We could hear them crawling up towards us through the thicket, aiming no doubt to make a rush on us and capture us. But when they made the rush, we succeeded in getting away to our lines. But the general told me I must take my men and recharge them even if it could cost the lives of all of us. Right there I felt at no time was death so certain as then. I told him we would do so, or try it anyhow. A marker stands at Spotsylvania just outside the woods where Crab’s picket line patrolled. We did it, and retook the lines at a terrible cost to us, as we had to charge through a clear field and they under cover of timber. But we retook the line with some prisoners, only to have them retaken from us again as they then were in great force preparing for the big charge on our main lines. That occurred in two hours, with the enemy breaking through our lines and many running away and some of us surrendering. I attempted to escape, but they had come in such great numbers that they were all in our rear before I knew it, not far from where I had started from. I ran into a great number of them unaware to me. I had on my sword but no hat, as I had lost it in some way running through the trees. They noticed me, and it looked like over a dozen were holding their guns to my breast at one time. Some of them wanted to shoot, and others did not want to because they could get to take me back to the rear, thereby themselves getting out of the battle. In this way I attribute my escape from death, as it looked as if they were determined to shoot me anyhow. A gang started with me, all claiming that I was their prisoner. Most of them had to fall out and go back to shooting. But the way they did hurry me back was a sight. And indeed I must have looked like a sight as I was there without coat, hat, et cetera. And when they got me back and put me in a crowd of many more prisoners, I found several of our company, among whom was W. W. Hulbert and Wm. McCormick and Fayette Greer and others of our company who had gotten captured. One or two of these we will meet again near the end of the war. Devastating as the losses were to General Doles’s command, the main action at Spotsylvania took place two days later when Grant recapitulated Upton’s tactic with 20,000 men. This attack – coupled with Lee’s error in removing his artillery from the salient the night before – produced a horrific battle in which the Confederates slowly moved the Union army out of the lines. Lee finally completed a new line across the base of the Mule Shoe. The Confederates fell quietly back during the night of May 13. Only dead and wounded remained. Gordon Rhea followed his prize-winning book on te Wilderness with one on Spotsylvania Court House. Rhea followed that book with a personal favorite, Carrying the Flag: The Story of Private Charles Whilden, the Confederacy’s Most Unlikely Hero (New York: Basic Books 2004). This last book encapsulates the battle of the Mule Shoe. A. Wilson Green, a former staff historian for Fredericksburg and Spotsylvania National Military Park, wrote the precis I quoted of the battle for the website of the National Park Service. The battle was epic. But Crab’s war seemed to have ended. The Yankees did not capture Uncle Judge. He remained a Confederate soldier. In fact, he was to campaign for 10 more months until the surrender at Appomattox.